The TCO (total cost of ownership) arguments for using solid state, lamp-free video projectors for installed AV applications are well established. And the market has spoken: the best, most popular, most robust lamp-free projectors today are laser phosphor projectors–now commonly called “laser projectors”. But not all laser projectors are created equal. The best new-generation laser projectors perform way beyond just providing better TCO with a lamp-free design. How can you be sure you’re future-proofing your AV installation for years to come, not just getting another “me-too” laser projector? Today, with the proliferation of laser projectors, an AV integrator or end user may think, “the choice is now simple: lamp-based projectors mean too many lamps to buy down the road, LED projectors don’t have the lumens I need, nor do the ‘hybrid’ projectors…so I’ll just pick a laser [phosphor] projector, and we’re good to go.” Smart integrators and projection users know that down that road lies costly mistakes, namely performance, TCO, quality and reliability shortfalls in a few short months or years after the initial purchase. Those mistakes can consume both limited budgets and manpower. Smart integrators know that the best laser projectors are not just about the “lamp-free” TCO math. The best projectors for the classroom, boardroom, meeting room and any installed AV application must have new-generation, key features that deliver not just better TCO but superior image quality, state-of-the-art engineering, installation options, and networking performance. It all starts with DLP: the preferred technology for those seeking the best new-generation projectors. LCD projectors have always had high maintenance costs due to having to aggressively cool the heat-gathering LCD panels. Since LCD is a transmissive not a reflective technology like DLP, the LCD panels absorb heat– a deal-killer for panel longevity and so projector longevity. And the DMD chip at the heart of DLP is all about image quality and longevity. LCD panels fade over time and will need replacement. And for DLP, a high quality single-chip DLP projector with 3X speed color wheel is intrinsically convergent, as opposed to 3-chip LCD systems, since the same device draws up R, G and B. On the other hand, a laser phosphor engine in concert with a color wheel is simply splitting color, with no adverse corollary effects. As a result, a 1-chip DLP laser phosphor projection such as Panasonic’s yields the best image processing by delivering the same image quality without artifacts as 1-chip UHD lamp-based projection. And for the best image contrast–the technical limitations of LCD prevent it from reproducing the deep blacks needed for high contrast. This is because LCD crystals cannot ever be turned fully “off” or moved instantaneously into a black/no transmission mode, as they are part of a transmissive architecture that is slower than DMD mirrors to respond to image changes– slower by orders of magnitude. Also, DLP is more efficient with light as it does not require, as does LCD, pre-polarization. But just as all laser projectors are not created equal, not al DLP projectors are created equal. The details of a DLP laser projector’s features and performance are key. And beyond the performance specs of individual projectors, installed AV is also about networking and about an integration landscape that is changing– and how the best new generation laser projectors fit into that landscape. Click here to download a new, in-depth White Paper-New-Generation Projectors for Installed AV- that looks at the industry challenges and business issues when when choosing the best laser projectors. Click here for information on industry-first displays and projection technologies, like 3-Chip DLP Fisheye Lens and LinkRay launched at InfoComm 2017. 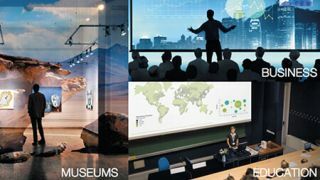 Click here to read a Case Study on the University of Copenhagen’s selection of laser projectors for teaching spaces and auditoriums.